I was gone from the house only a day and a half. Two nights. When I drove up, I felt that something wasn’t quite right. The dogsitter was parked in front of the garage so I couldn’t go in the normal way, but that wasn’t even it. I parked and grabbed my weird bundle of stuff (half a loaf of bread, a sweater that needs new buttons) and trundled in. 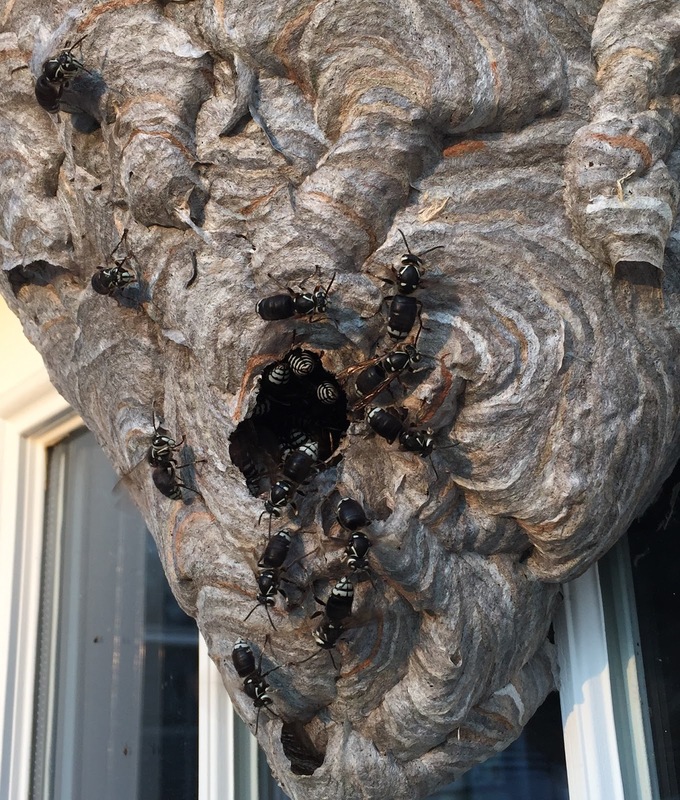 I didn’t have to look directly at the hornets’ nest to know that it had been violated. My stomach twisted in recognition before my eyes had registered what had happened. The nest was a damp, wet color, dark and greasy. It was quiet and limp. A dead hornet clung in the entrance, its body curled and its wings aloft. All around it on the siding of the house a great wet stain, glistening with poisonous wasp-killer. While I was gone–and without my permission–someone came and killed them. My dog sitter was in the kitchen eating her lunch. I was early, and had taken her by surprise, and I didn’t feel like ruining her lunch, so I said nothing of the stain on the house or the carnage it marked. We talked instead about the dogs. Her puppy brought me toys from the bin. I told her about Captain’s Hanukkah dog; the puppy brought me a Kong. She finished her lunch and left. I sobbed for the dead queens. I realized that I was holding out for the promise of the queens emerging to get me through October. We are leaving. It’s true. October promises to be busy and includes a yet-to-be-scheduled move and packing and the long lists of things to remember. We don’t even have a place to go yet. The landlord has put someone to work scraping and painting outside, so I can no longer go out and see sunset o’clock without getting chips of paint stuck to the bottoms of my feet. No wonder the hornets’ nest was spotted. Someone was helping out. I texted my husband a string of unintelligible nonsense, but including the word “hyperventilating,” correctly spelled, two times. The hornets were dead. The queens were dead. All their work was for nothing. All my hopeful waiting wasted. I texted various other people who I knew would sympathize. I sighed a lot. The nest had been almost done. There was no reason to soak it in poison. The nights are getting colder, and the workers were dying off already. The whole future of these bald-faced hornets was in the few queens that were meant to emerge last. They would be over-wintering in the trees. I loved that hornets’ nest. I thought people knew. I talked about it a lot, I took pictures, and now the pictures are all I have. I avoided going outside, but I couldn’t pack without crying. Finally, I resolved to run an errand. Two errands! I thought. I could do two at once! I exited by the patio door and walked the long way around the garage. I arrived at the drugstore and realized I didn’t even have my wallet. So I had to come all the way back. I finished the errands and collected my basket to go get veggies at the CSA. I played music loud on the way. Really loud. At the CSA we got three pounds of potatoes. They are loose in big wooden boxes and coated in a layer of dry dirt. This time I tried to pick ones about the size of hen’s eggs. I got two heads of lettuce and ¾ of a pound of carrots (which was four) and a single head of garlic and a cucumber and a head of cabbage. A bunch of rainbow chard and a bag of arugula (I took less than my allotment since I won’t eat that much in a week). 1 1/2 pounds of onions. I chatted with someone about weighing the 3/4 of a pound of green beans and chose 3 red peppers (that I won’t eat). I went outside to pick 25 flowers and 30 cherry tomatoes and as I tucked them into my overflowing basket I heard a child screaming in the parking lot. Last of all I had four pounds of tomatoes to choose, so I headed to the front where the tomatoes were. 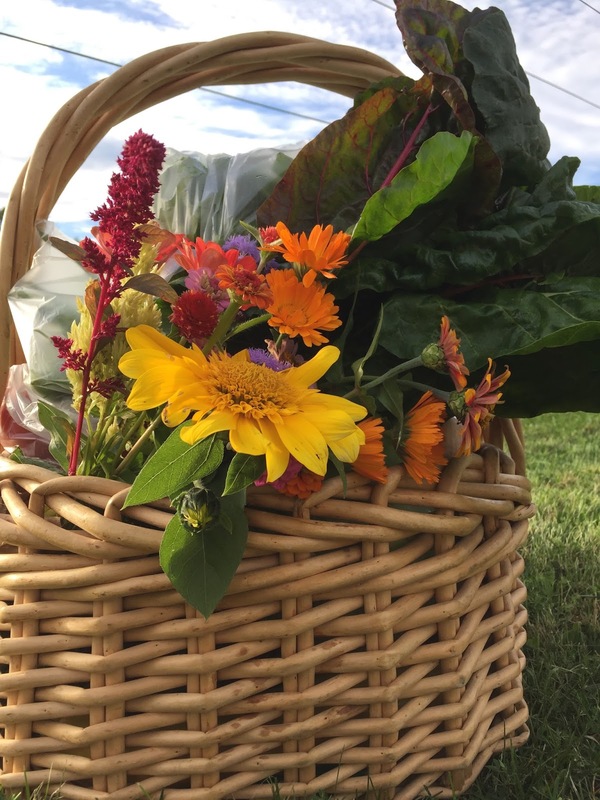 There are several mothers with young kids who also go get their CSA allotment on Tuesdays: one who speaks German and has her hands full with little blond M. who runs away when she calls to him, and another with an earnest four-year-old with large, dark, wet eyes and a mop of almost black hair. They must have reasons for bringing their young children here at the end of the day on Tuesdays and not coming on Saturdays. The hour before dinner is usually the hardest with youngsters. I saw M. disappearing behind a tractor when I came back in with my flowers. The small child was flushed from crying, with a tear still balanced on his lashes, and turned and gestured up with a single open palm. “It’s going higher and higher,” he said. I turned and looked up to see. There in the sky I spied the fast-disappearing pink dot that had been the boy’s balloon. He must have lost it when his mother opened the car door to help him out. And somehow because of what this woman said or what his mother said or because he’s filled with the miraculous bravery of being 4 or because watching things fly is magical and amazing, he was just able to watch the balloon rise impossibly high into the sky, away and away and up and up and up, until it was gone.